Turkish protesters have demanded the sacking of police chiefs in Istanbul, Ankara and other cities over their forces’ violent responses to demonstrations. They also rejected an apology by Deputy PM Bulent Arinc, saying his remarks “were reminiscent of a civil war”. A group calling itself the Taksim Solidarity Platform (TSP) said it had handed a list of demands to Bulent Arinc. The crackdown on protests over the redevelopment of a park in Istanbul last week triggered nationwide unrest. Overnight, police in Istanbul again fired tear gas, water cannon and smoke grenades at protesters. 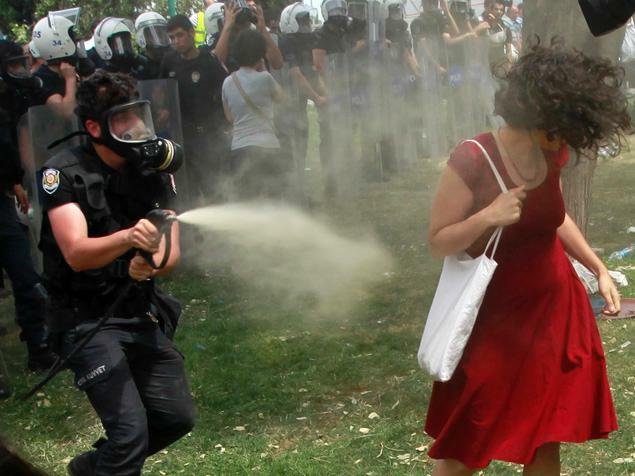 The demands presented by the Taksim Solidarity Platform on Wednesday included a ban on the use of tear gas, the release of detained protesters, and the scrapping of the plans for the redevelopment of Gezi Park, which is part of Istanbul’s Taksim Square. “The steps the government takes will shape the events,” the TSP said after their meeting with Bulent Arinc on Wednesday. On Tuesday, the deputy prime minister apologized to demonstrators who had been injured. He said the original protests had been “just and legitimate” and that the “excessive use of force” by police had been wrong. Officials have confirmed that two people have been killed in the unrest. One man died after being shot by an unidentified gunman in the southern city of Antakya. Another died after being hit by a car that ploughed into a crowd in Istanbul. The Turkish Human Rights Association said more than 2,800 protesters had been injured across the country, many of them seriously, and that 791 had been detained, of whom “around 500” have since been released. Bulent Arinc said that 244 police officers and 64 protesters had been injured, and more than 70 million Turkish lira ($37 million) of public damage had been caused. Bulent Arinc’s conciliatory remarks contrasted with the tougher line taken by PM Recep Tayyip Erdogan, who has said the protests are undemocratic. The state-run Anatolia news agency earlier reported that police had arrested 25 people for posting “misinformation” on Twitter. An official from the opposition Republican People’s Party (CHP), Ali Engin, told Anatolia they were being held for “calling on people to protest”. Recep Tayyip Erdogan said on Sunday that Twitter was a “menace” being used to spread “lies”. The original protests began in Gezi Park on May 28 but soon mushroomed, engulfing several cities and becoming more political. Demonstrators accuse Recep Tayyip Erdogan’s government of becoming increasingly authoritarian and trying to impose conservative Islamic values on a secular state. The prime minister is still the most popular politician in the country, but he is discovering that a ruling style that his opponents say is autocratic has its limits. Recep Tayyip Erdogan’s Turkey was seen as a runaway success by many in Europe and the Middle East; now it is looking tarnished, with deeper problems than its allies – and enemies – realized.